Discontent is simmering among Muslims in Uttar Pradesh who feel that while newly carved districts in the state were named after Dalit personalities, Muslims were ignored. 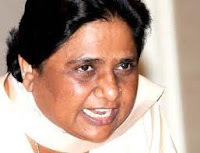 Muslim community feels that even though BSP supremo's vote bank chiefly comprises Dalits and Muslims, she hardly pays any attention to contribution of the Muslim leaders in UP. The formation of three new districts viz. Hapur, Sambhal and Shamli was announced by Chief Minister Mayawati early this week. The demand to declare Muslim-dominated Deoband as a district was however ignored. The districts have been named as Prabuddha Nagar, Panchsheel Nagar and Bhim Nagar. Muslims leaders say that since her first regime, she has been constantly naming districts after Dalits but never a district, scheme or major institution was named after Muslim leaders of freedom movement or Ulema. "While 56,000 Muslim religious scholars sacrificed their lives during the war of independence in 1857, Mayawati government ignores the sentiments of Muslims", said legislator and Samajwadi Party leader Qazi Imran Masood, who belongs to an influential political family in the state. "She just exploits Muslims after dumps them after getting the votes", he charged. Uttar Pradesh now has 75 districts. "I don't understand why none of BSP government's social welfare schemes have been named after a Muslim leader", he roared. The new districts have been carved out of Moradabad, Ghaziabad and Muzaffar Nagar. Earlier, two districts Chhatrapati Shahuji Maharaj Nagar and Kashi Ram Nagar were carved out of Amethi (Sultanpur) and Etah. UP has a population of 20 crore (200 million). Dalits form 21% of UP's population while Muslims constitute around 20% of the electorate. UP has 8% Yadav that mostly vote for Mulayam Singh's Samajwadi Party. While BSP large gets Dalit votes, section of Muslims and Upper Castes vote for it. Upper Castes that include Brahmins, Kshatriyas, Vaishyas and Kayasthas form another 15%. The rest are OBCs and intermediate castes. With Uttar Pradesh heading for a poll next year, Maywati is going all out to woo different sections of the society. She had also written to Prime Minister Manmohan Singh, demanding reservation for Muslims and Upper castes. But her strategy of naming districts exclusively after Dalit leaders may hurt her electoral chances, feel political observers.